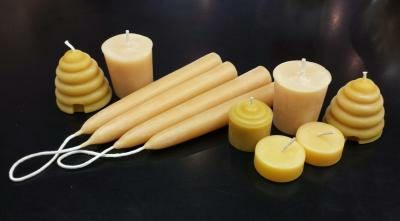 TTV = Tapers, Tealites & Votives ... in Beeswax candles these are the most popular. In this intro level, hands-on course you'll make candles to take home and enjoy, all from pure 100% Ontario beeswax. Made of 100% pure Ontario Beeswax the candles you make will be a joy to burn. With hands-on instruction from Head Beekeeper Cathy Kozma you'll learn the basics of working with beeswax, and make to take home 6 tealites, a pair of votive candles, a pair of dipped tapered candles, a moulded taper candle and a pair of rolled taper candles. We'll also discuss the use of more complicated molds for your future projects. Class size limited to 8.